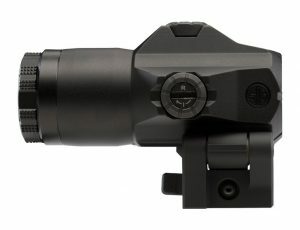 The JULIET4 4x Magnifier is designed to work as a stand-alone magnification solution or in conjunction with reflex optics. 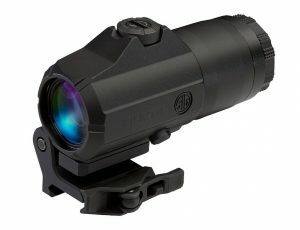 This family of magnifiers is an excellent choice for transitioning from close quarters to intermediate ranged targets. In conjunction with a reflex optic, the JULIET4 can be adjusted for height through the use of spacers. It has a PowerCam 90° Mount so it can be quickly flipped to the side for more immediate, close quarters scenarios or deployed rapidly to bring targets four times closer. Its quick release mount comes with built-in recoil lugs for repeatable zero. The JULIET4 has a front and rear thread-in lens protector to keep it secure from the elements. • Aircraft grade CNC aluminum housing ensures a lifetime of reliable service.